Change is a constant in human (and natural) history. But today, we have entered an era in which the pace, scale, and impact of change may surpass anything our species has previously confronted. Part of that change is social, brought about by the sheer scale and interconnectedness of the human enterprise. World population more than tripled in the last century, and the planet’s inhabitants are now linked like never before by dense global networks of commerce and information. But networks amplify disturbances: the 2008 financial crisis, for example, originated with risky mortgage lending in the United States, but in a thoroughly globalized economy, its impacts reverberated around the world. In this fast-changing, interconnected world, people and societies must be able to withstand shocks and disturbances and bounce back afterwards while maintaining important functions. They must be, in a word, resilient. Recently, resilience has become a catchword in international discourse: it is, for example, the theme of a 2012 report by the UN’s High-Level Panel on Global Sustainability and of the 2012 World Conservation Congress. But what does resilience mean, in practical terms, and what can be done to cultivate it? Researchers and practitioners from a number of disciplines have sought answers to these questions – notably ecologists, led by C.S. Holling, Lance Gunderson, and others; and psychologists such as Ann Masten. More recently, resilience has become a focus within the fields of disaster risk reduction, homeland security, international development, and business administration. A literature review commissioned by the Rockefeller Foundation surveys the evolving understanding of resilience across disciplines. From this vast body of research, some themes emerge. The ecological resilience thinkers show that diversity and redundancy are key. A resilient system has many ways to perform basic functions so the failure of any one component does not cause the entire system to crash. Resilient systems are modular. For example, communities that retain some self-sufficiency when disconnected from larger networks will fare better in times of crisis. Tight feedbacks confer resilience by enabling quick and innovative responses to changing conditions. As a result, a participatory and responsive local government is likely to be more resilient than a centralized, authoritarian regime. Other researchers have explored the resilience of linked social-ecological systems, especially in the context of climate change. These analyses show that social resilience rests on a foundation of human well-being: the health, education and economic capacity of a society’s citizens. Resilience is reinforced by social cohesion – the ties that bind families, neighborhoods and communities. Social cohesion, in turn, is strengthened by equity. A society’s resilience cannot be measured by GDP alone. Perhaps a better proxy is the UN’s Human Development Index, which grew from the groundbreaking work of Amartya Sen, Martha Nussbaum, and others. Sen observed that the essence of poverty is not simply material deprivation. Rather, poverty stems from limited choices in life, from a lack of agency and self-determination. Sen and Nussbaum elaborated a “capabilities approach” that calls for ensuring that all people have the means and power to live the lives they want. Those essential capabilities include the basics of human well-being: life, bodily health, and integrity as well as freedom of affiliation and control over one’s environment. While conventional poverty eradication focuses on addressing deficits, a capabilities approach seeks to promote and reinforce existing strengths. This understanding of resilience also offers a powerful rationale for women’s empowerment. Women are a mainstay of subsistence in developing countries, and thus play an important role in adaptation to climate change and other crises. In some parts of the world, women supply 80 percent of the food and 90 percent of the fresh water to households. Yet they comprise 70 percent of the world’s poor and two-thirds of illiterate adults. Women own less than two percent of the world’s titled land and often lack real control over the resources on which they depend. Many are forced into early marriage and childbearing; for example, nearly half of young women in South Asia are married before the age of 18. In these volatile times, resilience must become an organizing principle for international development. And while it is important to remember that no single intervention is a “magic bullet,” studies show that access to family planning and reproductive health services are integral to enabling women and bolstering resilience. Reproductive health is also central to other “capabilities.” Women who are able to plan their families are more likely to finish school, more likely to participate in economic and civic activities, and both they and their children are less likely to be poor. The Guttmacher Institute estimates that addressing the unmet need for reproductive health would reduce disability and premature death among women and their newborns by more than 60 percent. Around the world, some 215 million women have an “unmet need” for family planning services – they want to avoid a pregnancy, yet are not using an effective method of contraception. Ensuring that all people have the means and the power to make their own decisions about childbearing would have important benefits for women and their families. Given those benefits, and the cost effectiveness of these programs, there is hardly a need for additional reasons to make reproductive health a priority in international development. And yet, here is another reason: Reproductive health is a crucial component of women’s resilience, which is, in turn, essential to building robust families, communities, and nations. Investing in reproductive health can help individuals and societies survive and thrive in turbulent times. Sources: Adger (2000), Alliance for Global Conservation, Gender and Water Alliance, Guttmacher Institute, Harvard University Press, IPCC, International Gender and Trade Network, International Union for Conservation of Nature, Lloyd (2005), Nature, OECD, Population Action International, Population Reference Bureau, Ramo (2009), Rockefeller Foundation, Sanger (1920), Sen (1999), UN, UN Population Division, Walker and Salt (2006). 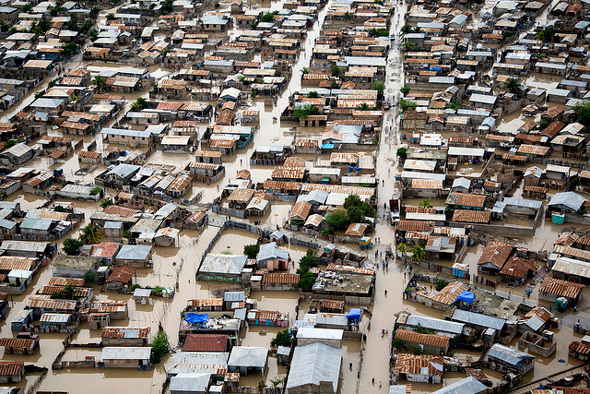 Photo Credit: “Hurricane Tomas Floods Streets of Gonaives,” Haiti, courtesy of United Nations Photo. While it's wonderful that so many ancillary benefits flow from women's empowerment, none of these should be seen as justifications for supporting equal status for women. Women's rights should NOT be seen as an instrumental right; rather they are a natural right — inalienable, and not dependent on any particular utility or promotion of other interests. It is disconcerting, to say the least, to read: "This understanding of resilience also offers a powerful rationale for women’s empowerment." What exactly does that mean? That if it turns out women's empowerment actually reduces resilience that we should no longer support them? While women's empowerment should be seen as a necessary condition for sustainability, that is because equity should be a fundamental plank of sustainability. A consequentialist argument for women's rights is one that does a disservice to women and denies half the world's population with the dignity and respect they deserve. This is a point on which otherwise like-minded people have been known to disagree. As a long-time feminist advocate for reproductive health and rights, I certainly agree that women's empowerment is vitally important in its own right, as a matter of human rights and social justice. Women's empowerment deserves our wholehearted commitment, regardless of whether it is necessary for sustainability or resilience. At the same time, I think it is valid to illuminate the other — very real — benefits that flow from empowering women. Over the last two decades, I have seen women's empowerment and reproductive health/rights marginalized in discourse and policy. Two examples come to mind: the demonization of family planning in the US; and the absence of references to reproductive health in the zero draft of the Rio + 20 "Earth Summit" document. The world's nations have failed to meet their commitments on funding for reproductive health, and the toll — in women's lives and health — has been enormous. The reasons for the marginalization of "women's issues" are complex, but I believe the situation could be helped by rebuilding a broad, diverse constituency for women's empowerment. That means highlighting the potential benefits to a number of different constituencies. After all, none of us belong to just one constituency: I care about women's empowerment because I am a feminist, but I am also an environmentalist, and I believe that women's empowerment will also have important benefits for sustainability and resilience. There are many reasons to do the right thing.